The Knights' Hall is the world famous centre-piece of the Dutch Houses of Parliament and a sightseeing highlight for a guided Tour of The Hague! 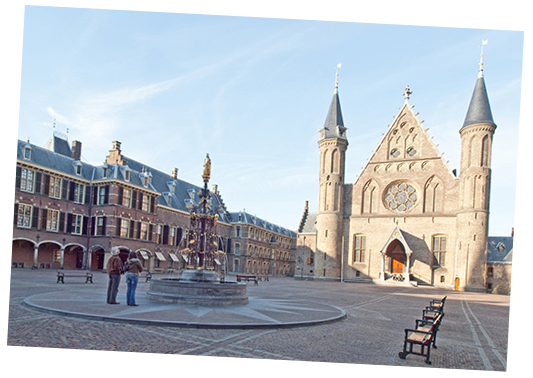 The Binnenhof (Dutch for Inner Court) is a complex of buildings in The Hague (also known as Den Haag) that has been the main meeting place of The Netherlands governance since 1446. Building started in the 13th century, the complex originally functioned as the castle residence of the Earls (or Counts) of Holland. The Main Hall, which has been called the Knights’ Hall since the 19th century, dates from the second half of the 13th century. The famous vaulted wooden ceiling was the largest of its kind for hundreds of years and was inspired by the ship building industry of that time. Since 1904 the Knights’ Hall has been the setting for the reading of the King’s speech at the annual opening of Parliament. In his speech, the King announces the Government’s plans for the coming year to the parliament and to the Dutch people. Tour The Hague Guided Tours always tries to guide you to the free Information Centre (however, often closed on Sundays) located directly under the Knights’ Hall and will provide you with insights into the Royal Family Tree of the House of Orange. A Tour The Hague Private Guided Tour does not normally tour inside the Knights’ Hall as access is restricted to government organised tours which are nearly always only given in Dutch, and to be honest, there is much more to see on the outside of the Knights’ Hall than the inside of an essentially empty hall with a few flags and a ceiling in the shape of an up-turned boat, and our time Touring The Hague (a.k.a. Den Haag) can be much better spent. The distant beginnings of The Hague lie in the creation of a settlement around a hunting lodge dating from the early 13th century, built by order of the Count of Holland. The Ridderzaal was the reception and party hall of this lodge. In the 15th century, Philip the Good met here with the knights of the Golden Fleece. The son of Philip the Good, Charles the Bold, resided here for some time in order to administer justice too. In the periods of history the hall fulfilled a wide range of functions; during the Napoleonic days it was used as an exercise hall. Since the restoration around 1900, the hall has been used for ceremonial occasions at a national and international level. The most important annual ceremony traditionally takes place on the third Tuesday of September each year. The day, called ‘Prinsjesdag’, the King presents the speech from the throne; officially announcing the Dutch Governments' policies for the coming year. The speech is addressed to the members of both Houses of Parliament (Senate and House of Representatives). Also present during the ceremony are members of the Royal House, Ministers, State Secretaries, members of the Council of State, diplomats and invited persons. The King’s throne is a much later addition in the Gothic style. At the top of the throne you see a carved letter B. It is the first letter of the Kings mother Queen Beatrix. The coat of arms of The Netherlands is embroidered on the back of the throne. The hall is almost 26 metres high and the roof is a true copy of the medieval one. It has the shape of a ship turned upside down and is made of Irish oak-wood. No nails were used for its construction, but wooden pins, so-called dowels. Wooden heads with big ears are installed on either side of the beams of the roof. The presence of these ‘eavesdroppers’ used to ensure effective administration of justice: witnesses felt they were being overheard by possible divine ears and would thus be inclined to tell the truth during trials that once took place here. In the stained glass windows you can see the coat of arms of a number of Dutch cities. In the large rose window, above the gallery, coats of arms are depicted of the House of Bavaria, Burgundy, Habsburg and others. Members of these noble houses have played a role in the history of the Netherlands. During a recent renovation some elements of the hall were replaced and some were added. A new carpet was brought in. The throne was provided with a new covering by French upholstery. The province flags were replaced with tapestries representing the Dutch provinces and the Caribbean part of the Dutch monarchy. Finally the words of the first part of the 1848 Constitution of the Dutch Monarchy were put up above the fireplace. At the top you see the stars of the European Union, thus linking the Dutch parliamentary democracy with the latest European cooperation.